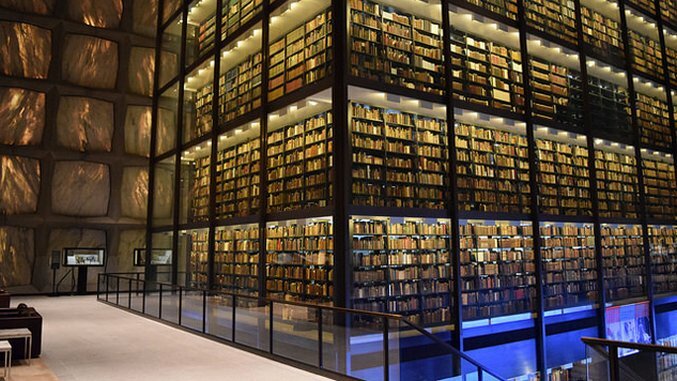 Photo by Brian, CC BY-NC-ND 2.0 Located within the Yale University Library in Connecticut, the Beinecke Rare Book and Manuscript Library is absolutely breathtaking. The 6-story glass tower is a far cry from the dusty stacks often thought of when conjuring images of university libraries. While it may appear all modern, its collections are far from it--the library is home to a Gutenberg Bible. Beinecke Library is currently closed for renovations, but will reopen in September. Tours can be arranged in advance via Yale's Public Services department. Photo by m01229, CC BY 2.0 No list of literary landmarks would be complete without a nod to the Library of Congress. It was established in 1800 to serve as a research library for the United States Congress and housed some 740 books upon opening. Today, it is the world's largest library by size and second largest by collection. It contains more than 38 million books across 838 miles of shelves. Additionally, the library's collections include 14 million photographs, 3.6 million recordings and 5.5 million maps spread across three buildings. Among its treasures is a 15th-century Gutenberg Bible. The Library of Congress is the nation's oldest federal cultural institution and continues to serve its purpose of providing a "rich, diverse and enduring source of knowledge to inform, inspire and engage them and support their intellectual and creative endeavors." Photo by Thomas Hassel, CC BY-NC-ND 2.0 In Stuttgart, Germany you'll find the refreshingly modern Stuttgart City Library. The 9-story glass cube that houses the city's central library opened in 2011 and features a 5-story interior reading room shaped like a pyramid that floods with natural light from its glass ceiling. Aside from the city's literary collection, the library is home to a cafe, rooftop terrace and an event space. Photo by hl_1001, CC BY-NC 2.0 Admont Abbey, a Benedictine monastery in Austria, is home to the world's largest monastic library. The Admont Library dates back to 1776 and today houses 200,000 volumes, 70,000 of which rest within the main hall. The interior of this Baroque library also features nearly 1,500 manuscripts and hundreds of incunabula, or books printed using metal type. Don't forget to look up. The ceiling showcases fresco paintings depicting the stages of human knowledge. Photo by BrunoDelzant, CC BY 2.0 Prague's Klementinum is home to the National Library of the Czech Republic. The Baroque complex ranks as the city's second largest after Prague Castle and dates back to the 11th century when it opened as a chapel. Throughout its history, Klementinum has served as a Dominican monastery, Jesuit College and a library for Charles University, among several other functions. It is located in the heart of Old Town near the Charles Bridge and is a popular destination, especially thanks to its main hall, which features 20,000 books, a collection of massive globes and a breathtaking fresco-painted ceiling. No trip to the Klementinum would be complete without climbing the 172 steps of its astronomical tower. Once at the top, you'll be rewarded with panoramic views of Prague and its famous orange roofs. Photo by Rob Hurson, CC BY-SA 2.0 Arguably one of the world's most famous libraries, the Trinity College Dublin library dates back to the college's founding in 1592 and today remains the largest library in Ireland. Its most impressive feature is the 213-foot-long main chamber of the Old Library, known as the Long Room. This large space holds 200,000 books and 14 busts of famous writers and philosophers who have supported the college, including Jonathan Swift. Photo by Boris G, CC BY-NC-SA 2.0 The 19th-century Royal Portuguese Cabinet of Reading in Rio de Janeiro, Brazil is the quintessential scholarly library bibliophiles fantasize about. The 3-story reading room is home to nearly 400,000 titles and counting. The interior architecture of the space is equally as impressive as its volume of books, featuring dark wood, gold accents, decorative arches, as well as Portuguese art. Photo by bclay, CC BY-NC 2.0 Among the the Seattle Public Library System's various locations there is a gem. Architecturally speaking, the Central Library is a modern masterpiece. The 362,987-square-foot, 11-story glass library has the capacity to hold nearly 1.5 million books. The non-fiction collection is especially noteworthy, as it's housed in a 4-story spiral of shelves that aim to display the entire collection without having to break it up among disjointed floors. The library is also home to the Microsoft Auditorium and several large reading rooms, one of which provides 10th-floor views out onto Elliott Bay. For those who have as strong an affinity for exploring the world via the written word as doing so in person, the week’s Bucket List is for you—a literary lover’s guide to the world’s best libraries.